Basically, the general idea of this project is to offer live streamed images from the web (such as this blog, Mars Explorer, or the news) and display them in different movie theater rooms. You will be able to walk around the theaters or sit down and watch the slideshow. 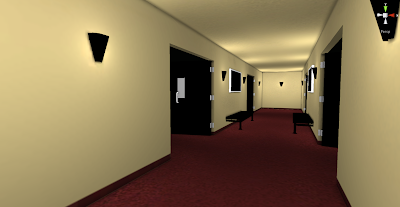 After much experimentation over the past few days, I managed to get the lightmap settings just right for the theater. I am still working on adding speakers, ceiling lights, and aisle lights. Below are some pictures of the theater with the lights on normal and the lights dimmed. Enjoy! Looking towards the back with the lights dimmed. Looking towards the back with the lights on normal. Looking towards the front with the lights dimmed. Looking towards the front with the lights on normal. A view of the lobby with soft shadows and AO. The shipwreck watercolor painting on the wall. Currently, I have all the models ready and am texturing them. This is a preview of what the lobby hall will look like (some things such as the doors, and lights are not yet textured in the picture). A fully lightmapped and AO calculated lobby hall.